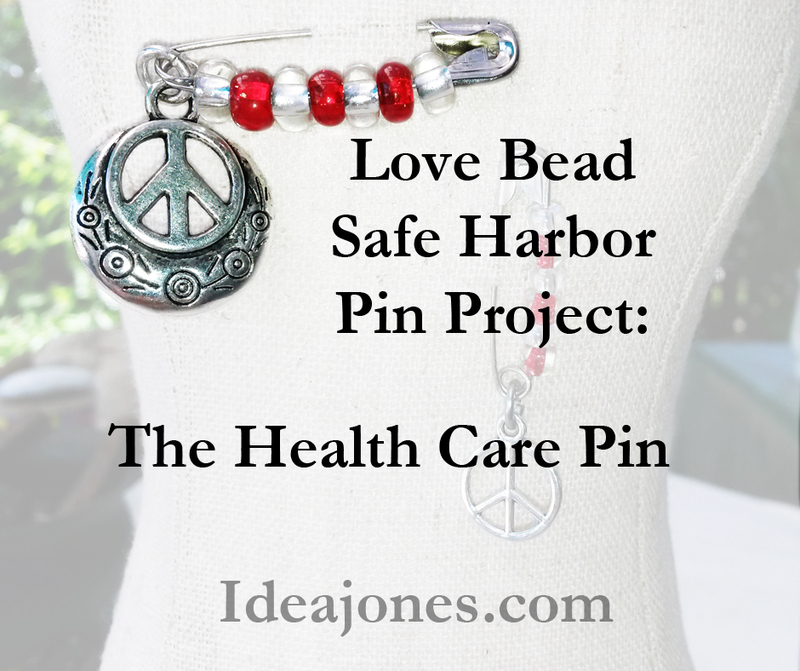 ← Love Bead Safe Harbor Pin Weekend Is Here! If you’re new to the Love Bead Safe Harbor Pin and you see one “in the wild,” on someone on the street, in a restaurant, at school, at work, or any of the places you might find cool people, you might wonder if there’s any significance to the color, or the charm hanging from the pin. The answer? Sometimes yes, sometimes no. The safety pin is what makes it a “safe harbor” pin. So no matter the color or decoration, it’s still a Safe Harbor Pin. The rest is about standing up for a special cause that is close to your heart. It doesn’t mean you don’t care about anything else, just that this particular cause is one you’re especially passionate about, or is especially relevant to your life, or in the lives of people you know. Whether your life is saved or not shouldn’t depend on your income. This was something suggested to me by a Pin Sponsor, one of the fantastic people who got online and asked to buy a set of pins and sponsor a set to be distributed free to someone else (maybe you?). She wanted a pattern that signifies a commitment to seeing that people are able to find and afford the health care they need. She suggested the red and white pattern, which is also used by emergency health care providers and disaster relief organizations. Wearing this pin shows that access to affordable health care is an issue close to your heart (a phrase which takes on added meaning in this case). You believe that you, and that person over there, and people you don’t even know exist (which, if you think about it, is almost all people, since there are billions of human beings and you probably can’t name them all) deserve access to affordable, effective health care. Sure, there is a debate to be had about whether or not society should pay for treatment that doesn’t have a lot of scientific evidence to support its effectiveness. Or whether or not society pays for, say, somebody’s plastic surgery to change the shape of a nose that works fine, as a nose. Those are things we should debate and decide. But should your neighbor die of heart disease because he can’t afford to see a cardiologist? Should kids be crippled or killed by disease because their families can’t afford the vaccine that would prevent it? Is there a basic level of health care that should be accessible to everyone? Here’s one reason why society (meaning all of us) benefits when there is general access to decent health care: no matter how wealthy a person may be, he isn’t self-sufficient. We depend on millions of other people to make, sell, repair, clean and cook things we need or want. Those people do a better job if they’re healthy. And if they don’t have to wait to be treated until whatever it is becomes an emergency, our own health care costs go down. And they aren’t hocking up germs on whatever it is they’re working with because they couldn’t see doctors, which means we’re healthier. We need lots of people at work, earning a living (and they have more available income to spend if they don’t have to go into bankruptcy due to health care costs), making things, buying things. Healthy people do a lot more of all of that stuff. Yes, you should be able to get your eyes checked, the cavity in your tooth filled, your flu shot, your blood pressure checked and treated if needed. So should I. So should that person over there, and that one (What’s his name? He looks kind of familiar…), and her over there (I think she works at the supermarket…). Yes, that baby with the inherited muscle problem should be able to get it treated so she can walk. Yes, that toddler who ate a watch when nobody was looking should be able to get it removed, by a doctor, in a safe facility. The peace sign on this pin? Peace of mind. Freedom from anxiety about how we’ll manage to see doctors, or dentists, or get whatever medical treatment we need. For you, for me, for everyone (yes, even that guy whose name we can’t remember. Him, too). This entry was posted in Art, IdeaJones, Jewelry, Love Bead Safe Harbor Pin Project and tagged #healthcare, #lovebeads, #pins, #randomactsofart, #safeharbor, #safeharborlovebeads, #summeroflove, 1960s, 60s, health care, IdeaJones, Joey, love bead, love beads, random acts of art, safe harbor, safe harbor love beads, summer of love. Bookmark the permalink.